The longlist was announced on October 10 and on November 14 the shortlist was announced. The final award will be announced at the Tata Steel Kolkata Literary Meet which would take place in Kolkata between Jan 22 and Jan 27, 2019. The final award will be announced at the Tata Steel Kolkata Literary Meet, Kolkata. The DSC Prize 2018 shortlist was announced on November 15 at the London School of Economics & Political Science. The Prize, that is in its eighth year, focusses on South Asian fiction writing and is considered one of the most prestigious international literary awards. 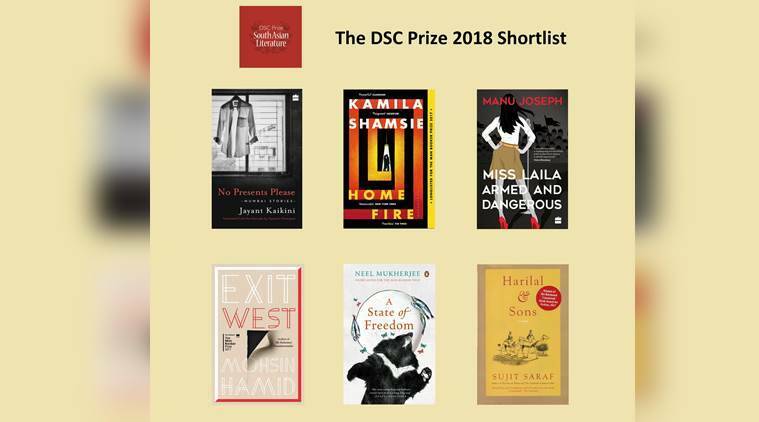 The six shortlisted include Jayant Kaikini’s No Presents Please (Translated by Tejaswini Niranjana, Harper Perennial, HarperCollins India), Kamila Shamsie’s Home Fire (Riverhead Books, USA and Bloomsbury, UK), Manu Joseph’s Miss Laila Armed And Dangerous (Fourth Estate, HarperCollins, India), Mohsin Hamid’s Exit West (Riverhead Books, USA and Hamish Hamilton, Penguin Random House, India), Neel Mukherjee’s A State Of Freedom (Chatto & Windus, Vintage, UK and Hamish Hamilton, Penguin Random House, India), and Sujit Saraf’s Harilal & Sons (Speaking Tiger, India). “Being the chair of the jury of the DSC Prize has been one of the most enriching experiences of my life. I say this for two reasons. One is the sheer intellectual excitement of reading, evaluating and discussing these works of fiction. The other is the interactions I had with my four colleagues on the jury. I know I learnt an enormous amount from all of them and for this I am profoundly grateful to all of them. Evaluating these books reminded me once again of the importance of reading in human lives.” Jury Chair Rudrangshu Mukherjee said on the occasion. The longlist was announced on October 10 and included books like Anuradha Roy’s All The Lives We Never Lived; Arundhati Roy’s The Ministry Of Utmost Happiness; Chandrakanta’s The Saga Of Satisar, translated by Ranjana Kaul; Deepak Unnikrishnan’s Temporary People; Jayant Kaikini’s No Presents Please, translated by Tejaswini Niranjana; Jeet Thayil’s The Book Of Chocolate Saints; and Kamila Shamsie’s Home Fire. Manu Joseph’s Miss Laila Armed And Dangerous; Mohsin Hamid’s Exit West; Neel Mukherjee’s A State Of Freedom;Perumal Murugan’s Poonachi, translated by N. Kalyan Raman; Prayaag Akbar’s Leila; Rita Chowdhury’s Chinatown Days, translated by Rita Chowdhury; SJ Sindu’sMarriage Of A Thousand Lies; Sujit Saraf’s Harilal & Sons; and Tabish Khair’s Night Of Happiness.